Can social media be used as a tool to incite social change? The Square. An Egyptian Revolution. An interesting screenshot from The Square documentary depicting the media’s role in society. One of the largest revolutions of our time, started with a Facebook post encouraging an Egyptian revolution, and for citizens to come to down to the square and protest the mistreatment of the people. The Egyptian people lived in an era without the slightest form of democracy, forcing them to live under emergency law for 30 years. The secret police had a tight grip on the public, stopping anyone who tried to speak out against the Mubarak regime. The Facebook post sparked anger at the news that had been hidden by mainstream media networks, and it showed people the atrocities being performed by the government. The timeline below gives a glimpse into the resilience of the people as they used any methods they could to fight for freedom. The revolution began. People headed to Tahrir Square to show support for the people and stand against corruption. The documentary ‘The Square’ followed Ahmed Hassan, Khalid Abdalla, and Magdy Ashour, three entirely different people with very different backgrounds, who are some of the vast majority of people who united at the square against a common enemy. After constant protesting in the square President Mubarak steps down, entrusting the care of the nation to the Armed Forces. Celebrations erupt and the people praise freedom. The people do not leave the square, as the secret police are still active. The army promises the protesters that they will not be harmed, and eventually the crowds disperse. However people soon realised that nothing was changing. No one was put on trial for the corruption and murder, and the secret police still remained in power. Two months after the start of the revolution, they were still under emergency law. The manipulation of the people continued to happen and some felt change had already happened, whereas others felt the regime had continued. Those who were sceptical of the regime’s downfall marched back to the square to protest, but tensions were higher now. The army began to threaten the protesters who had returned. One day without warning the tents were cleared by the military along with hired civilians and the poles were used to beat the revolutionaries. They forcibly evacuated the peaceful sit in, to disperse the protests. This unjust behaviour was ignored by mainstream media. “It wasn’t on BBC. It wasn’t on CNN. It wasn’t anywhere.”, said one of the people Khalid was filming. People had been arrested and taken to the nearby museum to be beaten and tortured. This drove Khalid to gather people telling them to film the corruption and violence to post on popular media sites such as Youtube and Facebook. He wanted a global population to see the truth, as it wasn’t being reported either locally or worldwide. This would continue the revolution. One year later and the protests had lead to an election, which some of the Egyptian public were not happy about. They had no trust in the political leaders of the parties or their politicians. Mohammed Morsi leader the Muslim brotherhood came into power, but once again some people were sceptical. There were still protests and tensions rose between the Brotherhood and the revolutionaries. The agree to give this government time to make radical changes that turn their nation into a democracy. Skipping on another year and it appeared that Morsi’s promises were untrue. He abused his powers causing conflict between the brotherhood and the revolutionaries, and the media manipulation continued to distort the public’s perspectives of the truth. 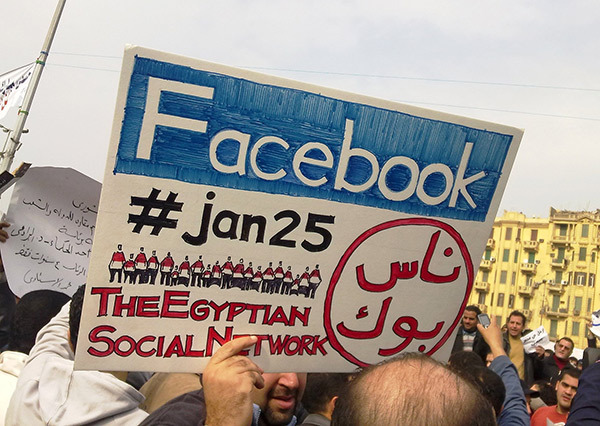 The revolutionaries continued to be active on social media, spreading the truth where they could, and they still protested at Tahrir Square. The people of Egypt had woken up and the protests increased. Morsi uses the news networks to threaten the public, by saying he would not step down. Millions of people flooded the streets in anger, causing one of the biggest revolutions the world has ever seen. The pressure from the public was so great that eventually Morsi had to step down. Ahmed and Khalid are still fighting for an alternative to the military or brotherhood rule. They kept fighting to try and pave a clearer path for the next generations to gain their freedom. This timeline shows just how integral social media was in both starting and developing the revolution. It was highly effective as an initial communication tool, particularly in grabbing the attention of people on a global scale. It is important to note on the other hand, that a lot of the organisation of the movement and the negotiating, was done through face to face communication, meaning other forms of communication were just as valid in fighting their cause. The mainstream media networks ignored certain facts in order to shape news stories, and social media can help stop that. It can fill in the gaps of knowledge that are kept from the public eye, and it should be used as a tool in this way. To provide the truth. The information for the post was gathered from watching, ‘The Square’ a brilliant Netflix documentary. There is a lot more information on the governments motives along with their manipulation of the people through the media and political messages. Another documentary that presents very similar themes of corruption, is ‘Winter on Fire: Ukraine’s Fight for Freedom’. This shows the same tactics that were used in the Tahrir Square movement, from both the government’s methods, and the protester’s reactions. I recommend anyone who found this interesting to watch these documentaries and read up on the subjects. However it is not for the faint hearted. There are images showing the appalling acts the government and military forces committed on the public, which may be disturbing for some people. Wow, what an eye opener! Really great post… keep them coming. So How Effective is Social Media? Institutional Racism, a Structure Built on Inequality. What Can Social Media Achieve?